Every Mother’s Day I usually wake up super early in the morning to go to the store and buy flowers for all the Mothers in my family. This year I made these beautiful chocolate bowls instead. I used a regular bowl as my mold for my chocolate bowl and set it in the refrigerator to harden. 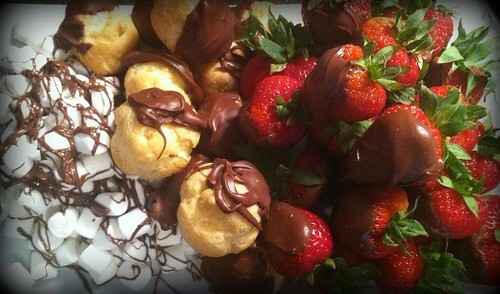 I used some milk chocolate to cover my strawberries and mini cream puffs (found in the frozen desserts section of my grocery store). 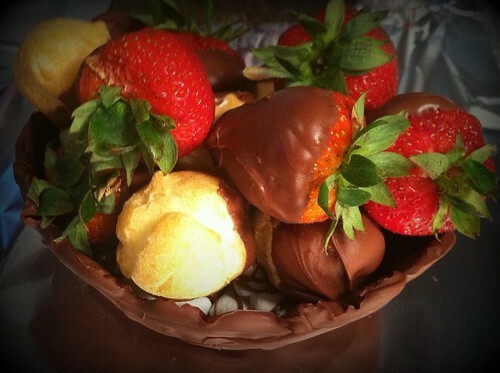 I then filled my chocolate bowl with mini marshmallows and drizzled with chocolate and arranged the cream puffs and strawberries over them. I had some extra, so I placed them on a plate for everyone to enjoy. I love edible gifts!